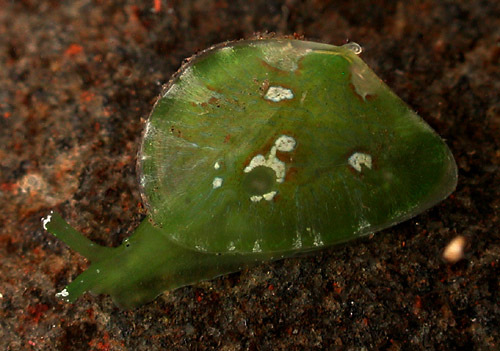 Natural history: Berthelinia pseudochloris is a rare species found in moderately exposed to highly exposed rocky areas on algae of the genus Caulerpa on which it feeds. (Note 2) The five animals we've seen were at depths of < 1 to 3 m (< 3 to 10 ft). Like some other sacoglossids, it releases a milky secretion when disturbed. Distribution: Maui, Oahu, Kauai and French Frigate Shoals. Photo: CP: 6 mm: found by PF; Honokowai Beach Park, Maui; Oct. 9, 2010. Note 1: Shells of this species show weak to moderate red fluorescence under ultraviolet light (395 nM). Note 2: On June 13, 2013 we observed a large animal feeding on a small form of Caulerpa racemosa(?) in a holding dish. It had previously ignored a small piece of Caulerpa serrulata.